Looking like its been carved out of the sandstone cliffs, Sunset Ashram, as the name suggests, is the place to relax with your fellow sun gazers. 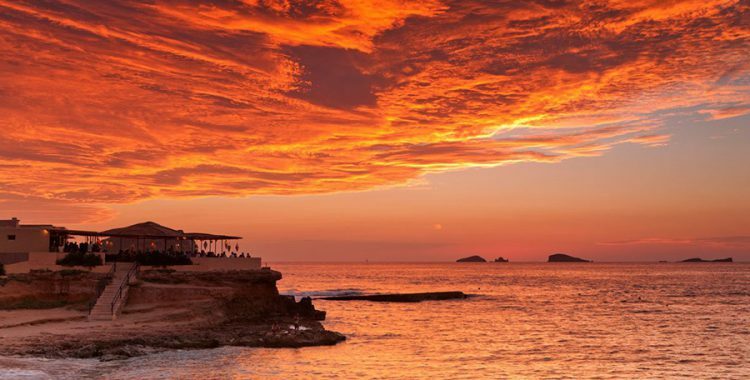 Its a great spot to watch the sun go down after your great Ibiza vacation day. In high season, expect a DJ playing Balearic chill out music.I Its a very busy spot throughout the season but the location and atmosphere cannot be missed during your Ibiza vacation. Serving Tapas, Sushi, Indian inspired dishes and, of course, Drinks. So sit back, enjoy the incredible Ibiza sunset over Cala Conta Beach, or Platges de comte as you may find it signposted on the Ibiza roads.